To connect Your Gionee mobile to computer, you need to Download Gionee PC Suite. In general now all device drivers get installed automatically in higher versions of windows. But there are some error or problem in connection. To make trouble less connection we need PC suite and suitable drivers. So here i am sharing How can you Download Gionee PC suite for free and also Download Gionee mobile USB drivers for Computer. With these two tools you can now easily manage your mobile from your PC. You can sync, transfer file, backup and lots of other feature. Gionee Mobiles , its a good brand now India also. It has already covered a great market in India competing other big brands like Samsung, Micromax , Xiaomi and others. There are lots of smartphone that Gionee had launch in India and they keep on releasing something new. Its become very difficult for users to search for tools for that devices. So here you can get all Gionee Mobile PC suites and Gionee USB drivers. These drivers will work perfectly with all versions of Windows including Xp, 7 , 8, 8.1 and 10. With Gionee USB drivers installed in your PC, you can easily connect your Gionee Smartphone to computer. You can transfer any file, image, video or any other easily with a USB cable. You can sync your phone data with your PC. You can manage your mobile from PC itself. This also allow you to backup and restore Gionee mobile data. It is also helpful in running internet in your PC from your Gionee Mobile data. You can also root and install any custom recovery with USB connections. Go to above link select your Gionee mobile model and Download the Gionee PC suite accordingly. Gionee USB Drivers Downloads from here. Go to above link select your Gionee mobile model and Download Gionee USB drivers accordingly. So now you have download Gionee mobile PC Suite for your Windows PC. Now you can easily connect PC to mobile. 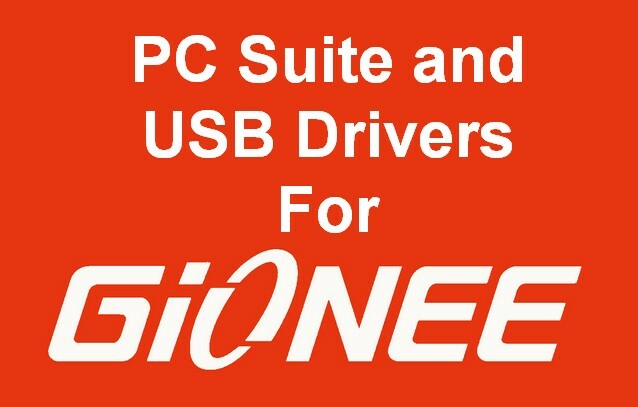 If you still have any problem in downloading Gionee PC suite and USB drivers. Just comment below we will get you the right USB drivers for your PC.